1- Feeds the fluid to the inducer/impeller. This is called the suction nozzle. 2- At the outlet of the impeller, the fluid is collected and then slowed down, converting velocity into pressure. This is called the volute. 3- The rest of the casing is devoted to various static mounts of seals, bearings, pressure taps, etc. We will focus on the volute since the suction inlet is best done as a straight axial tube if possible, and the rest of the casing parts are highly dependent on the specific design. Volutes are broken down into two major groups: plain volutes and diffusing vane volutes. 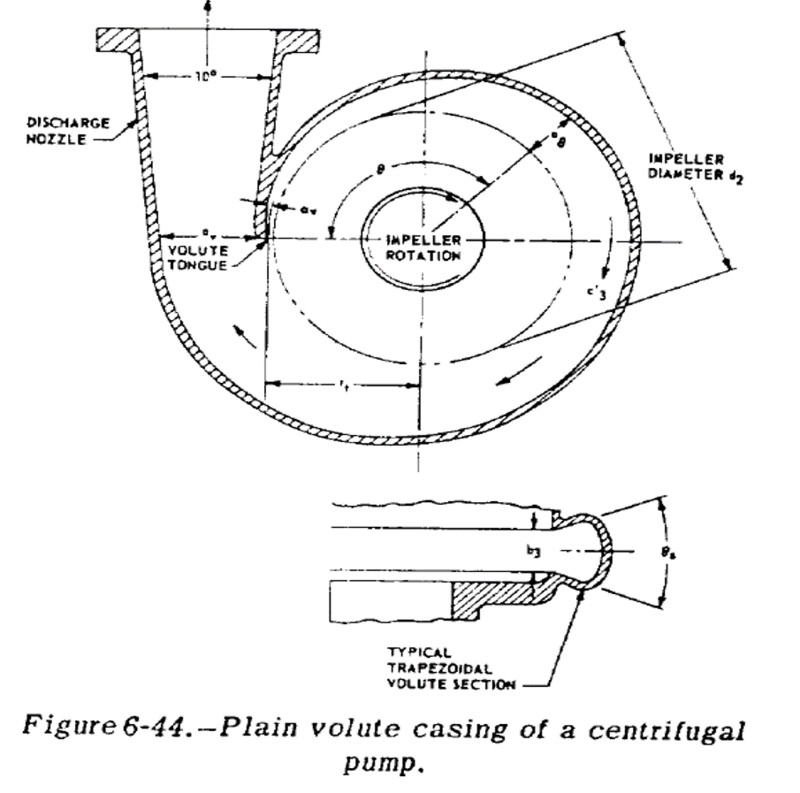 In the former, the impeller discharges into a a single volute that gradually increases area; then the fluid is diffused in a conical expansion at the volute exit. In the later, the impeller outlets into a series of vanes that do the majority of the diffusion and the volute acts as a fluid collection. The diffusing vane is theoretically more efficient, but they are more complicated to design and produce and have worse off-nominal performance. In addition, for small pumps, there is an inefficiency associated with fluid drag on all of the vanes and, as such, plain volutes are all that we will talk about for pumps under 5000 lbf rockets. Plane volutes are fairly easy to design. b3, the volute width, is equal to 1.5-2x larger than the impeller width. Then you keep the average flow velocity of the volute constant over angular location. The minimum volute diameter for the volute radius should be 5-10 percent larger than the impeller diameter. Then, for the discharge nozzle, expand the flow at between 10 and 12 degrees until the flow velocity is equal to whatever you want for the nominal tubing flow speed. And those are the basics of a volute. Next post, we will put everything together for a simple pump design.